Get my eBook – FREE – when you sign up for my monthly newsletter! For Your Privacy: We will not share your name or email with anyone, for any reason. By signing up, you are providing your consent to receive a monthly newsletter and be informed of interesting guitar-related information and offers. You may change or request deletion of your information at any time. 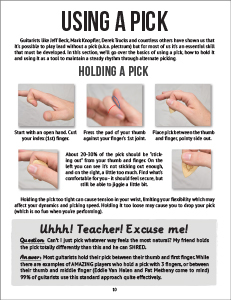 …and tons of exercises to help you get it all under your fingers! As you’re working on your lead guitar technique and knowledge, you should take the time to learn some actual songs. 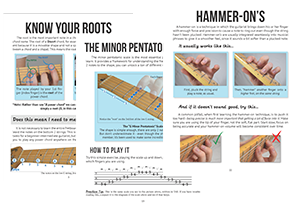 These lessons range from beginner to intermediate difficulty and, even if you can’t play them yet, they will give you a chance to see the contents of our eBook in action. If you’d rather spend your time strumming chords that’s great! 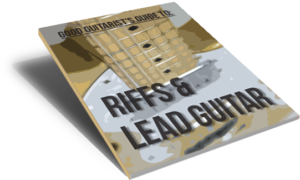 We have another eBook that covers a whole other side of playing guitar that might be better suited to what you’re interested in. You can check out our first eBook, “Guide To Chords, Strumming & Rhythm Guitar” here.